It’s no surprise that Neon Rae founder Jillian Dillon decided to plant roots in the Westside’s Del Rey neighborhood. The area, situated close to the beach, lends itself to the airy, dreamy, and peaceful calm that is synonymous with Jillian’s personality. The home, with its color palette of greens and blues, is filled with miraculous light and texture. Vintage treasures take center stage on modern, natural wood furniture. Plant life embraces nearly every corner of the home, while rainbows dance across the ceiling and walls. 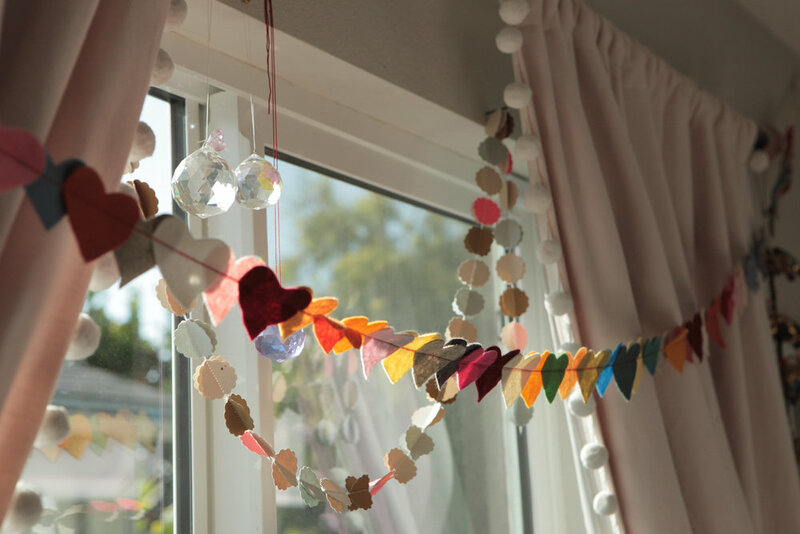 Driftwood mobiles, adorned with feathers and crystals ground the bedrooms, as the whisper of enchanting wind chimes lingers in the air. In short, this home is a love letter to Mother Nature’s beauty. We spent an afternoon with Jillian, listening to Van Morrison, and discovering how she’s made Southern Californian living so effortlessly cool. What is your profession and who do you live with? I own an online kids and gifting business called Neon Rae. Occasionally, I’ll work as a stylist. I live with my dear husband Mark, and my daughter Staley Rae, who will be five in August! It’s California-meets-Midcentury, so lots of neutral tones with comfy and calm spaces. How would you describe your personality and the personality of your home? Well, I’m laid back like a palm tree. My home, on the other hand, is a perfectly organized disorganization. I love rainbows, flowers, and pottery. I really enjoy things that are ever-changing, cyclical, and sturdy, but fragile all at the same time. I love objects made with natural fibers or materials, often in their natural state. Touches of color, here and there, are usually inspired by nature or landscapes. My bedroom gets amazing light throughout the day and I feel like I am perched up above. It's also a great place to hide since it's tucked upstairs at the back of the house. It’s always changing, depending on the time of the year and what’s happening. Honestly, we spend a lot of time on adventures that take us out of the home; but when we are home, it’s always a constant migration between outdoor spaces, the living room, and dining room. What is your favorite item in your home and why? It’s way too hard to answer that one! Everything I choose to bring into our home is filled with so much intention or personal feeling: pieces of art all by great family friends, photography by my mother or my good friend Chris, and then all the little treasures and things I've picked up on travels or gifts brought from far away lands. How have you translated your aesthetic into Staley’s room? I like to plant little vintage treasures with hopes she will gravitate towards them and enjoy their uniqueness and story. What is your favorite thing about Staley’s room? I adore her little collections of things from our travels. It's such a delight to go into her room every day and see how she's arranged them differently or what she's added. There's also a real warmth and calmness to the room even though it's an explosion of collected items. What are some of your favorite things to do with your child in your space? I really push for Staley to explore within and learn the creative process of play. She has always been very drawn to learning and academics. It’s so sweet to watch her get lost in her own world with her toys and overhear the conversations and dilemmas she creates for them. Junk shops. I frequent lots of junk shops! We love to take impromptu road trips all over the Southwest and I'm a huge sucker for thrift stores, charity shop,s and junks stores. If I see one, you betcha, I'm gonna stop off at it! Luckily, I have a very patient husband who appreciates the value and savings of such spots! How did your love of discovering rad finds in thrift stores inspire you to evolve the Neon Rae brand from moccasins into a curated gifting company? I've been a hoarder and collector for years. Thrifting has become a fun way to spend time with Staley, but we don't have a lot of extra shelf space. So, when friends started asking me what would be good to pair with the moccasins, it made sense to share some of my finds with everyone. I source new and vintage items for the gift baskets; I love how vintage objects tend to lean toward more natural materials. I try to make sure my gift baskets are filled with items that will have many lives and sustenance. It’s been really fun discovering the passion that comes with giving a great gift and also seeing or hearing about the joy the recipient receives. What are some of your favorite items to gift that lend themselves to being unexpected or unique decor objects? Hands down, the most appreciated is the Paradise People blanket. They are so beautiful and have this amazing softness that comes with a few washes. The blankets have so much versatility of use for everyday life. Second best would be the basket itself. It’s one of the best household items ever; it can work as storage to help keep your home organized, or as a vessel for an impromptu beach hang or picnic, and it simply rocks for farmer’s market hauls. The baskets are ageless and trendless — just perfection. Lastly, I love fresh bedside bouquets from Flowerboy Project. Who doesn't love an easy-breezy bunch of flowers to brighten up your day or space? 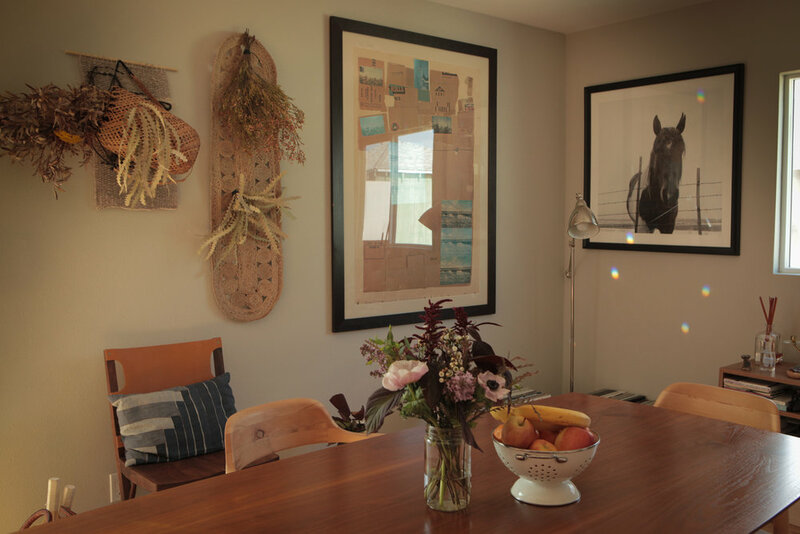 Thank you Jillian for sharing your home and treasures with us! Follow her Neon Rae adventures here.